Big BIG FINISH Week: Doctor Who - THE SPECTRE OF LANYON MOOR Review | Warped Factor - Words in the Key of Geek. Tony Fyler is feeling impish. 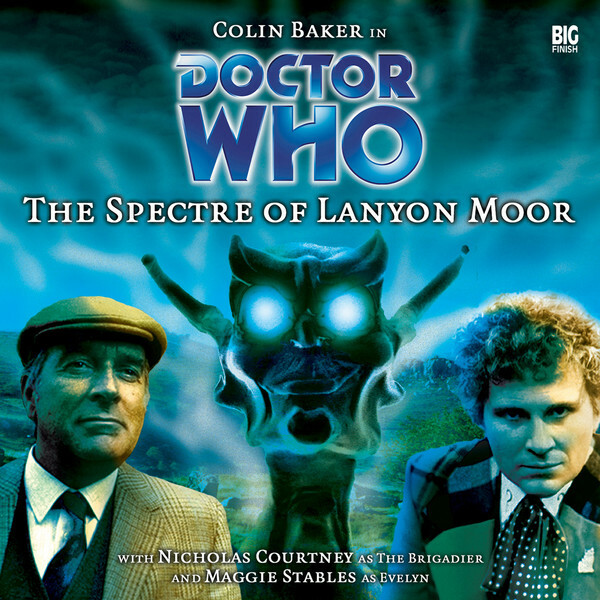 The Spectre of Lanyon Moor takes us right back, almost to the very beginning of Doctor Who on Big Finish, and one of the first things to hit you straight between the ears is how young Colin Baker sounds as the Sixth Doctor. His Doctor too is almost identical to the TV incarnation, bringing a brio to the party familiar from stories like The Mark of the Rani. More than that though, there’s a youthful storytelling inexperience to Lanyon Moor which still manages to work well, by selecting its ingredients with a good deal of care and Classic Who fan precision, leaving you with plenty to listen to even if, like me, you come to it with a 15 year delay. First of all, as even a cursory glance at the cover would show you, it ticks a big fanboy box by bringing the Sixth Doctor and the Brigadier together. It’s only when you hear that happen that you realise how badly you’ve been subconsciously wishing all these years that Mawdryn Undead was a better story – the chemistry between Nicholas Courtney and Colin Baker as the Brig and (at that point) Young Sixie bristles with fun and friendship, the Doctor allowing himself a chuckle when the Brigadier immediately recognizes him by his fundamental Doctorishness, with a little note that ‘You’re getting better at this.’ Essentially, the fundamental ‘retired’ Brigadier never changed very much on screen or in Big Finish – if you compare Lanyon Moor to Minuet In Hell, for instance, when he meets the Eighth Doctor, there’s a high level of consistency, as there is his UNIT stories and even the Unbound stories with David Warner’s ‘wrong’ Doctor, and it’s that sense of consistency which, you realise on listening to Lanyon Moor, was really missing from Mawdryn. So – the Brigadier in fighting form, and making a relatively easy connection even with this most prickly of Doctors – big tick. The relationship between the two here enhances the pleasure of listening to the story by a factor of three or more. Then there’s the material from which The Spectre of Lanyon Moor draws what sound very much like its influences: there’s more than a pinch of City of Death here, but played much straighter, with aliens trying to take off from Earth in the distance past, and failing, and then being forced to steal priceless ancient artefacts to get their revenge – even if, to be fair, they don’t look like priceless ancient artefacts in this instance – no wisecracks about the Mona Lisa’s eyebrows here, thank you very much, we need as much gravity as we can lay our hands on to make the central conceit work. And to anchor that element in place there’s a good healthy dollop of The Daemons – mysterious ancient humps in the ground used by Neolithic people, rural English snobbery and cunning backstabbery all combined with an alien who’s been mythologized by the locals as a creature of legend, but who’s actually just immensely powerful, on a survey and more than a little grumpy when he wakes up. There’s even a little scoop of The Awakening in here too – horrible-looking local legend with psionic (rather than psychic) projects of itself beggaring about the place scaring people silly. If you’re going to combine three stories, then picking City of Death, The Daemons and The Awakening shows a connoisseur’s taste, and The Spectre of Lanyon Moor blends its elements well. Is the story perfect? Noooo, not by a long way – the twists are occasionally quite predictable, and on the other hand occasionally seem to be made with no very logical reason except that we need a twist right there and then. James Bolam, bless him, tries hard in the role of local aristocrat Sir Archibald Flint, but never quite convinces – a lifetime of more working class performances working against him here in a way which, for instance, it didn’t later in his career when he played Dr Harold Shipman on TV. And the imp-like alien at the heart of the story almost feels like he’s being whipped along at the end by writer-director Nicholas Pegg, beyond the point of the evaporation of his sustaining natural motive. You get a sense of him ‘having’ to be bad and unreasonable, just to lead to a satisfactory conclusion that, adding in another Classic story, echoes strongly of Battlefield. But there are some excellent performances, matching up to the central players, the Sixth Doctor, the Brigadier, and a still-early Evelyn Smythe played by the always-fabulous Maggie Stables: Toby Longworth’s grumpy Welsh archaeologist, Professor Morgan is a delight - a man as spiky and hard-headed as the Sixth Doctor himself, but it’s Susan Jameson as his housekeeper Mrs Moynihan who really steals the last half of the show and gives it both a buoyancy and a drive that almost papers over the illogicalities and MacGuffinry of the plot towards the end. The Spectre of Lanyon Moor isn’t, with fifteen years of hindsight, among Big Finish’s best – but that’s only really proof that the company has outdone excellence so many times during its life to date. Heard fifteen years late to its party, it still provides excitement, some properly creepy thrills and kills, a delicious dynamic between the Doctor and the Brigadier, and an homage to a handful of Classic TV stories, delivered with a confidence and an oomph that make it, still, a highly enjoyable listen.